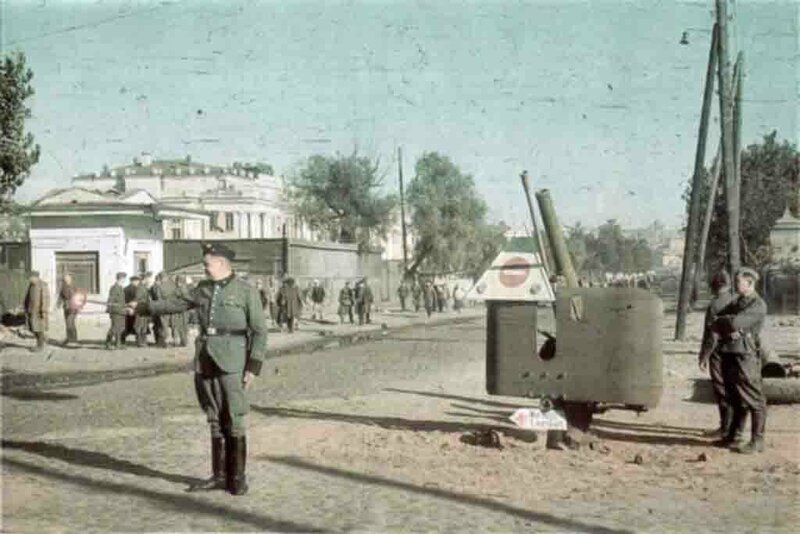 German traffic regulator in occupied Kiev near the building of the Promacademy on the boulevard of Taras Shevchenko. The photo was taken 10 days after the fall of Kiev by the German military photographer Johannes Höhle, who served in the 637th company of propaganda, which was part of the 6th German army, which seized the capital of the Ukrainian SSR. In the right hand, the adjuster holds a staff. On the right is the Soviet 76.2 mm Lender antiaircraft gun, left from the time of the defense of Kiev. On the armored shield the German triangular road sign “the passage is closed” is reinforced with three light reflectors. Under the cannon shield is a pointer-arrow with a red cross and the inscription: “Kriegs Lazarett” (military hospital). On the right is a metal transformer box. In the depth of the frame, you can see the houses on the boulevard and the dome of the cathedral of Vladimir.